This entry was posted in Interior design and tagged beni ourain, brass tables, Home, Interior design, svenskt tenn by Carolina Engman. Bookmark the permalink. Carpet and palm print pillow are superb!! OMG ! I’m in love ! I hope one day have something similar ! Your apartment looks gorgeous! I love it. I love what you did with your living space, can’t wait to see the rest of the appartment! Obsessed with your rug and all the little home decor is adorable, unique little pieces. so exciting! love the new apt! This looks so fabulous and artistic. Very tastefully done! Your style is superb! Love this space! this is a lovely space, i love the patterns and artwork, and especially that coffee table!! What a great deco, love your apartment! Wow! You are truly talented in interior styling! It looks amazing! Those tables are simply stunning! Love your interior! Looks amazing! Amazing!! Love the mood of your new apartment..
Love those nesting tables, cool room! Your new home looks so beautiful and unique! I love it!! The space looks small yet modern and artistic!! BRILLIANT! love the great colors, details and that light from NY. I love the way you use color. Ahw I love the patterns and colors contrasting the white! This is just perfect!! Love your taste regards home decor! Wow your apartment looks so dreamy, I love it! I want a house like yours! Your apartment looks great!! I love it so much! I adore white spaces that have a hint of colour! Looks so minimal and fresh. in love with your sense for interior design! 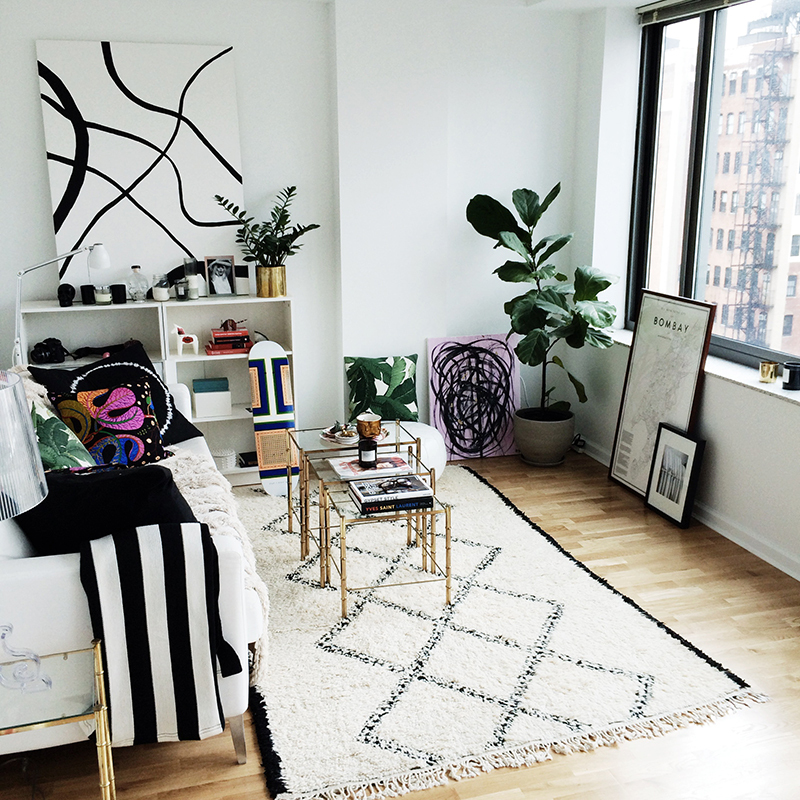 Your apartment looks so chic and comfy in the same time. I do like it! So bright and bold. Very cool! love the bombay map and decorates skateboard! The skateboard and the pillow are perfect! Wow i love your livingroom. Oh wow love it! I love that you are doing it yourself (you are aren’t you?). Keep us updated with more pics. Oh btw, where did you get your pillows? Love the prints. Wonderfulll new apartment! The board fit in perfectly and the bed is also nice. http://fashionmix.com <Fashion Mix – Find new fashion styles, mix them and then shop! I love the nesting tables!! As an Aussie living on the coast,I’m drawn to the tropical pillows…..thery’re gorgeous! Where did you find the framed map of Bombay? Thanks! 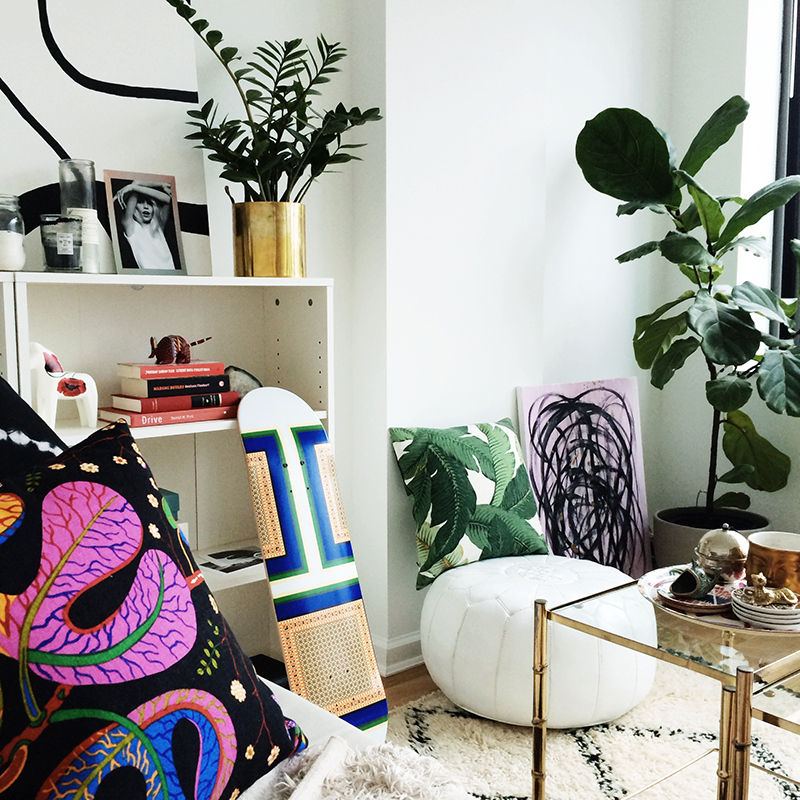 Love the cushions (and the rest of the apartment) – where are they from? Thank you!